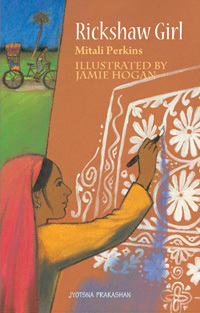 Naima loves to create the traditional 'Alpana' patterns Bangladeshi women and girls paint in their homes for special celebrations. Her designs are always the best in the village. Naima wishes she could help earn money for her family. Her friend Saleem can drive his father's rickshaw. If only she had been born a boy, Naima thinks.